Surah 50 Qaf: Great News: Usually understood to mean the News or Message of the Resurrection. The Islamic Defrauders (Al-Mutaffin) will try to raise doubts regarding Qiyamah by referring to surahs 50:41-45 (Qaf ) which talks of Qiyamah as well as Judgment Day, i.e. of two separate and distinct times. 0r who gives ear and earnestly witnesses (the Truth). . . .
And listen for the Day when the Caller will call out from a place quite near. Verily it is We who give Life and death; and to Us is the Final Goal. The Day when the earth will be rent asunder, from (men) hurrying out: That will be a Gathering Together - quite easy for Us. We know best what they say; And thou are not one to overawe them by force. So admonish with the Qur'an such as fear My Warning! "4974. As Christ said (Matt. xi 15), "he that hath ears to hear, let him hear." These are matters of high moment. Many spiritual lessons can be learnt from these things by anyone who has the heart and understanding to apply to Allah's teaching and can give genuine thought to what he sees, as a witness does who has to swear to the facts on his oath." 4982. The word Al Sayhatun (mighty blast) is used for the Resurrection (as here) or for the sudden punishment of the guilty on this earth, as in 11:67, where see further references. 4939. Here the Qaf is taken by several Commentators to represent Qudiyah al Amr, "the matter has been decreed," with reference to the eschatological trend of the Surah. Allah knows best." The interpretation that there will be a mighty Blast is partially correct; the addition that there will be sudden punishment is outright fabrication. Since the Islamic scholars have always taken both the Day of Qiyamah and the Day of Judgment as one, it is easier to be misled and mislead, even if there are other contradictory factors. The reasons behind these misinterpretations have already been discussed in the previous pages, and also form part of the Blast of Truth. By insinuating that there is going to be a "sudden punishment of the guilty", the falsehood that judgment will take place with the beginning of Qiyamah is repeatedly indoctrinated, even though it hardly makes any sense. In the first place why should humans be punished on Earth itself before being even judged? 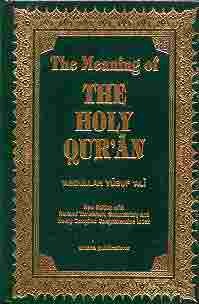 Where does the Qur'an say that there will be "the sudden punishment of the guilty on this Earth?" But Resurrection and Judgment are definitely two very different times, and there is absolutely no question of immediate punishment. Resurrection is the wake-up Call, the Blast of Truth for all humans to begin a lifelong spiritual purification. Each and every human being born on this Earth since time immemorial will be reborn. In other words each and every human who walked on Earth since creation will be born again to participate in the Resurrection. They will "come out of their graves" i.e. be born again as humans and informed that Qiyamah has begun. This is what the Qur'an refers to as "the Day the Drive will be (all) to thy Lord!" Right at this very moment there are humans surrendering to the Call of Al Qiyamah, giving up all their immoral past, accepting the Blasts of Truth, spiritually cleansing themselves as they know the Return to the Kingdom of God has begun. ""Kafara, kufr, kafir, and derivative forms of the word, imply a deliberate rejection of Faith as opposed to a mistaken idea of Allah or faith, which is not inconsistent with an earnest desire to see the truth. Where there is such desire, the Grace and Mercy of Allah gives guidance. But that guidance is not efficacious when it is deliberately rejected, and the possibility of rejection follows from the grant of free will. The consequence of the rejection is that the spiritual faculties become dead or impervious to better influences. . .
We now come to a third class of people, the hypocrites. They are untrue to themselves, and therefore their hearts are diseased (2:10.) The disease tends to spread, like all evil. They are curable but if they harden their hearts, they soon pass into the category of those who deliberately reject light." Abdullah Yusuf Ali, The Holy Qur'an, p. 18, 1989. But stupid, ignorant guardians of religious regimes are making Him into a cruel callous God ever ready to inflict a sudden horrendous wrath on the faithful herd who stray from the grazing ground. These dull shepherds and arrogant fanatics will not bow to Revelation, and neither will they allow their religious sheep to do so. They will reject the Good News because Khudda prophesied so. So be repeatedly forewarned, Unbelievers (Al-Kafirun), be repeatedly forewarned! The misinterpretation of verse 50:37-45 also plays a major role in relating Qiyamah to Judgment Day. Sure "the matter has been decreed." The commencement of Qiyamah has now been officially decreed to all the nations. Sure this is with reference to the eschatological trend of the surah. The manifestations of the Ayat (proofs, evidences, verses, lessons, signs, and revelations) of Qiyamah are the long awaited manifestation of this surah. Sarcastic remarks made by the Unbelievers (Al-Kafirun) regarding 'gathering together of dust and bones', just to belittle the Believers, have been misinterpreted as referring to the Resurrection. The Qur'an admits that these were remarks of disbelieving humans, not the sum and substance of Allah's Message. The rude taunts of the disbelievers cannot be interpreted and regarded as the essence of the surah. It is beyond belief that so many million Muslims are enlightened by the sheer mundane interpretations of their scholars, despite glaring flaws and obvious nonsense. It is also inconceivable that Allah forgot (or did not know) that there were millions of Hindus and Buddhists existing in the East who cremated the dead, and scattered the ashes to the four winds and into seven seas. Do the Muslims really believe that He had no knowledge of these major religious groups as the Qur'an was being revealed in the sixth century? How are their dead going to be resurrected when they don't even exist, the dust of their bones dispersed all over Earth and digested back into the food chain? The atoms of these cremated dead are now part and parcel of millions of insects, plants, animals and human beings. Surely Allah was not maliciously intending to destroy billions of cremated humans who will never rise from graves during the Resurrection? Or are cremated humans not eligible for Qiyamah, as is being implied by the Muslims? Since the Resurrection applies to all human beings why do Islamic theologians make Allah appear so ignorant? Concerning the Great News (5889) about which they cannot agree. Verily, verily they shall soon (come to) know! . . .
And placed (therein) a Light of Splendour . . .
"Tell all the nations and tell all the people all over the Great Message that the Time of Resurrection is here. Now! At this Time! - And that you are capable of doing it." "If I am saying there is this All-Pervading Power around us, you have to have a scientific attitude towards it to understand that this is a hypothesis at this stage, but later on, if I prove it, then you have to accept this as the Truth. As honest people, you have to accept it. If it is for the emancipation of all the human beings, if it is for the benevolence of the whole human race, then why not have it?"